This entry was posted in Books, Military history, Papua New Guinea, World War II and tagged David Campbell, David Denholm, David Forrest, Men in Green, The Last Blue Sea, Worl War II by cassmob. Bookmark the permalink. One of my favourite books ever – so evocative and so well written. A side of the war I would never have known about if i hadn’t found this book many years ago. I recently bought an un-corrected proof copy and it is even better than my old copy. I have spent a fair bit of time researching it’s veracity and I think it is almost certainly deeply rooted in the truth and the information here… http://www.awm.gov.au/histories/second_world_war/volume.asp?levelID=67908 backs this up. I totally agree Sean and yet many people have never heard of it, or read it. I had to study this book in 8th grade in Brisbane in 1961, and its evocative descriptions of the PNG jungle and terrain became etched in my mind. It was no doubt one of the subconscious influences that resulted in my working in PNG for two years in the 1970’s and while there, meeting and marrying my wife in Port Moresby. I fell in love as well with the people and the country and left part of me there when I left. I did several extended walks in the central highlands and across the Owen Stanley Range in my spare time, and the memories of studying “The Last Blue Sea” were a constant companion as I experienced the real PNG for myself. I still have my original first edition hard cover copy and must read it again! Hi Ian, Thanks for getting in touch and apologies for my delayed response. It’s amazing, isn’t it, how a book can have such an impact on our lives. Like you I read it in the early 60’s but it was meeting my husband in Brisbane that took me to PNG. I was impressed by your explorations. The late great British military writer John Keegan once nominated his two favourite novels depicting combat in WW2- ‘The Thin Red Line’ (1962) by US author James Jones and ‘Flesh Wounds’ (1964) by British writer David Holbrook. I am convinced that if Keegan had ever read Forrest’s novel, he would have added it to the other two. Thanks for visiting and commenting with such informed and reflective detail. You’ve also given me some additional reading. I’ve lately been absorbed in learning more about POWs in Germany during WWII…fascinating, depressing and sobering. Dave Denholm (aka David Forrest) was my history lecturer and later a good mate. He served in the 59th Battalion so knew his stuff. If you want an exceptional study of australian history, read his The Colonial Australians. Dave, like most, never really talked about his war experiences, although one episode really stuck in my mind. He was giving a talk on the necessity of confronting and recognising our individual biases and their relationship to writing about history. He asked us earnest young pups who is a racist here? Of course, no one admitted any such fault. David replied that he was. Not that he would ever do anything nasty, but his experiences meant that if he saw a Japanese person walking toward him, he would cross the road – after all those years he was deeply uncomfortable in their presence. Dr David Denholm, one of the loveliest and intelligent men I have ever met, RIP. Or as he put it to me once “Call me Diiiive” (in his best put-on ocker drawl. One of the very best books about war ever. Loved it. Whenever I see a copy I buy it to give away. I also loved his hilarious book “The Hollow Woodheap” about young bank clerks in Brisbane during the Sixties. A very keen observer of humanity, and an excellent writer to boot. Thanks Pete. I haven’t seen “the Hollow Woodheap” so I’ll have to look out for it. True authenticity when a soldier who fought there endorses it. Must look up the other book. here is a short review of the book that I recently wrote for the US website – negelectedbooks.com. David Forrest was the pen-name of Australian writer, academic and historian David Denholm (1924-1997). Among his numerous works of non-fiction, including an acclaimed history, The Colonial Australians about the early white settlement of the country, were a few novels. The Last Blue Sea, published in 1959, was his first. The book drew considerably praise and attention when released in Australia and the US. However, the novel went out of print by the early 1970s and was then largely forgotten. Penguin Books Australia published a reprint in 1985 but the book has remained off the shelves since. Forrest, a veteran himself of WW2, fought with the 59th Battalion of the Australian Army in New Guinea in 1943. That unit, although it had fought as a regular formation in the First World War, had been down-graded to a part-time reservist (militia) unit during the inter-war years. When the Second World War began, the 59th was re-assembled as a militia force. During the war, such militia units, comprised of conscripts and a smaller number of part-time reservists, formed a large part of the Australian army after 1942. During the war, there was considerable animosity between the militia units and the men of the AIF (Australian Imperial Force), the latter comprising the volunteers who enlisted in the early part of the war. With some justification, the AIF units regarded themselves as better-trained, more professional and more motivated than the Militia men, whom the former nick-named “Chockos” i.e., chocolate soldiers who always melted under fire. There was no doubt that some militia formations deserved their poor reputations, especially those that remained garrisoned in Australia and were rife with in-discipline, desertions and poor morale. 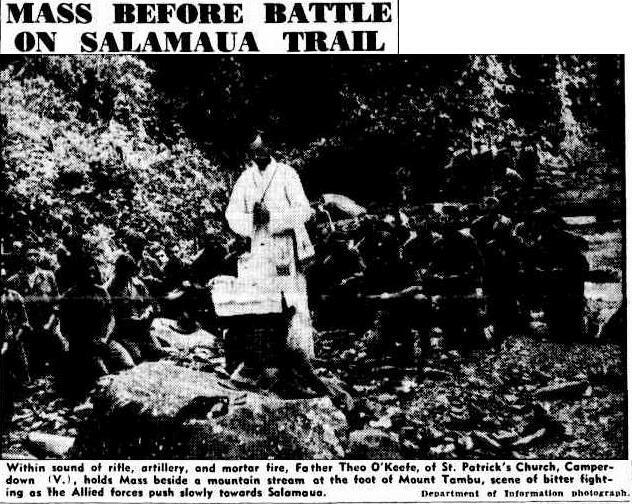 Yet some militia units performed remarkably well in the New Guinea Campaign, most famously at Kokoda in 1942. One can say “remarkably” considering the often poor training, lack of equipment and indifferent leadership many militia units were burdened with (some men arrived in New Guinea literally never having fired a rifle before). With this background in mind, Forrest’s novel depicts a Militia unit—the 83rd battalion—in the campaign in eastern New Guinea in 1943 as US and Australian forces advance northwards, slowly pushing back the Japanese. The story is told from the viewpoints of a number of characters, including the battalion’s senior officers. But the primary focus is on one platoon and, in particular, on one of its’ sections comprising a Corporal and eight privates. If the novel has any main characters, they would be two privates, 19-year-old Ron Fisher, a Bren-gunner and 26-year-old Robert “the Admiral” Nelson, a former schoolteacher and now an Owen (Australian-made sub-machine-gun) gunner. Nelson, the oldest of the section, has the fatherly role of the group. Yet even he, with his worldly wisdom, appears in awe of Fisher, an enigmatic figure, mature far beyond his years and whose background is only hinted at but indicates that he survived a tough childhood and is now a man that understands life more than many men twice his age. The platoon engages the Japanese in the steaming, thickly forested steep slopes of New Guinea. The enemy, under-supplied and starving, fight desperately and with suicidal courage. In this struggle, there is no quarter, the enemy is never examined close-up, he remains a distant, hated figure. The militia men have to endure the taunts and insults from their AIF cousins. As the platoon advances through a ruined town, watching them are some AIF commandoes who snort with contempt “any battle they start, we have to finish.” The army is on a race against time, not just against the enemy but against the jungle and its climate. The campaign must be won before too many men succumb to malaria and before their rotting uniforms literally fall from their bodies. The Last Blue Sea remains curiously little-known in Australia, despite the lavish attention bestowed on this nation’s military history. It is one Australian novel that deserves a fresh audience.